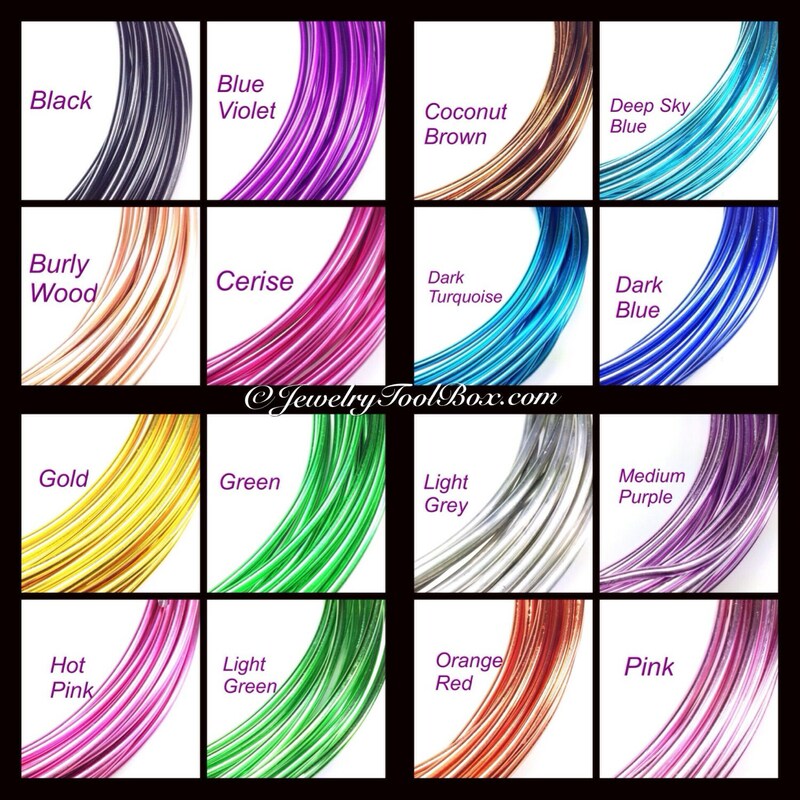 This anodized aluminum wire is just plain fun to work with and comes in lovely colors. Choose any or all of the colors. It is 12 gauge (2mm thick) and comes in an 18 foot coil (about 6 meters). It is dead soft in temper. It is so soft and pliable that the thickness is easy to work with - even for those with arthritic hands. You can work harden it and hammer it and punch holes in it. It is great for many crafts! Will not fade, tarnish or rust. *** This wire is VERY VERY SOFT. 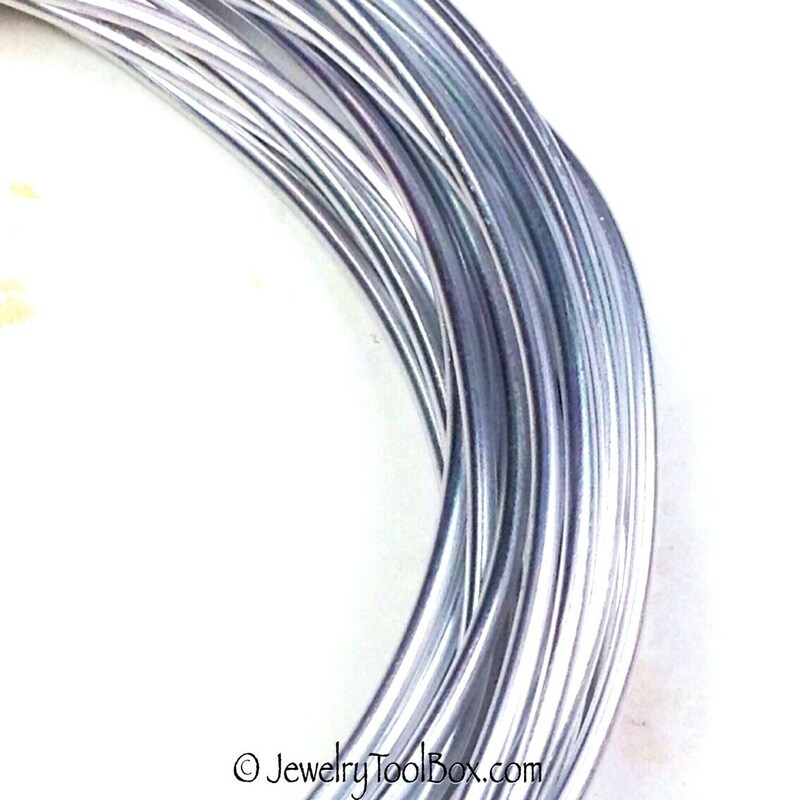 If you are not familiar with aluminum wire you may be surprised. Ask me if you are not sure. It is ideal for shaping. It is easy to work with--bend it, twist it, cut it and punch holes in it. It won't rust and resists tarnish. These anodized colors are shiny. The silver color is silver all the way through. The other colors are a coating over the silver. When you cut the wire you will see the silver at the cut. 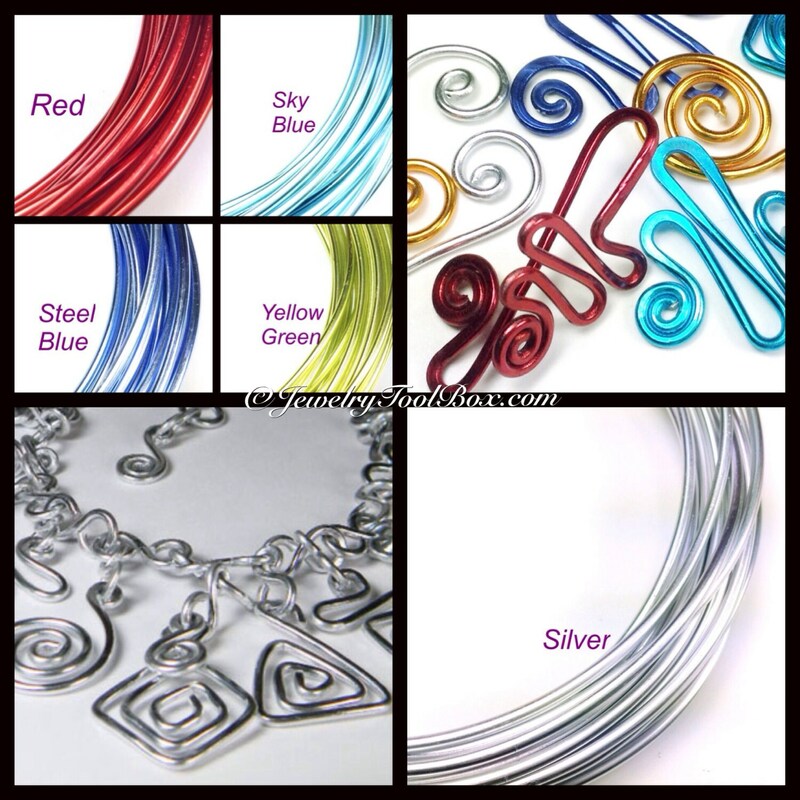 Notice the picture with shapes I made in colored wire - you don't see any of the silver. It turns out lovely and is just plain fun to work. Often referred to as floral wire as it is used in floral design. It is a great medium for jewelry and home decorating. 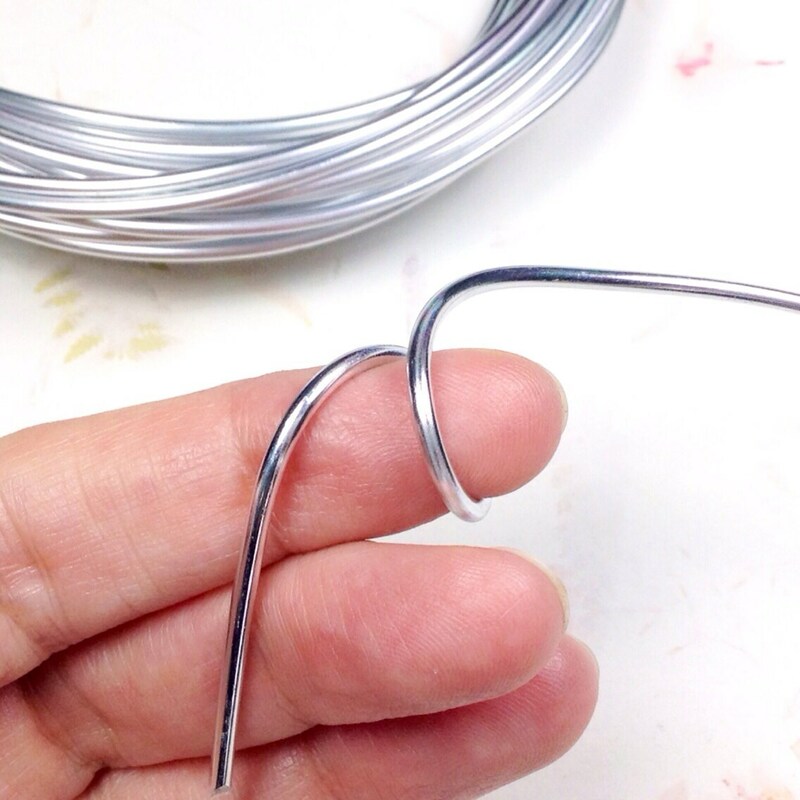 I use it extensively in teaching new students to work with wire. 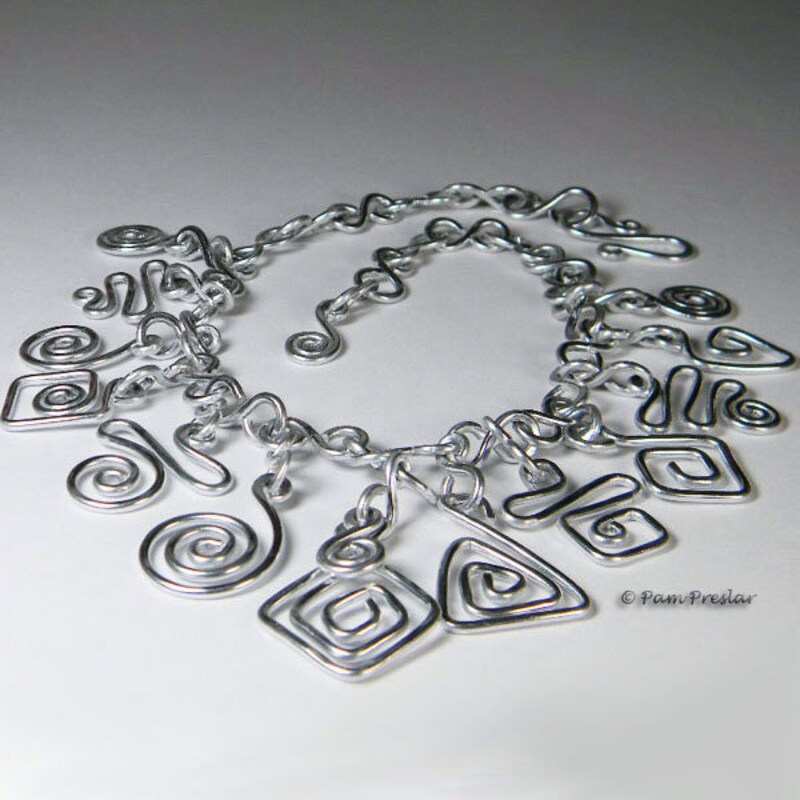 This tutorial covers making all the shapes shown in the necklace photo. ALWAYS WEAR SAFETY GLASSES when working with wire. I accept all of the major credit cards and PayPal. STANDARD SHIPPING is with USPS first class mail or Parcel Select with delivery confirmation. Packages go out the next business day or sooner. I can never guarantee arrival dates. If you need your package by a certain deadline I STRONGLY recommend you use the Priority Mail upgrade. Select that option in your cart before checkout. I find these travel the quickest and are more certain to arrive within the USPS expected dates. These are also not guaranteed however. If you are worried about delays in transit contact me to help you with tracking it. Shipments showing delivered by USPS are considered to be delivered to you. Contact your mail carrier right away if you don't find the package. Otherwise missing packages require filing of a mail theft report. Track your incoming packages so you know when they are as scanned arrived. This limits theft or misplacement of your orders. It is very hard to help you if you contact me well after it was supposed to arrive. I insure all orders. By purchasing you agree to comply with my requirements of claims for loss or damage. Orders shipped via Priority Mail are insured by USPS with their insurance claims policies. Otherwise, I follow Etsy shipping insurance guidelines. These are found at http://www.shipsurance.com/etsy/terms. Basically, claims for lost packages require 20 days for domestic shipments and 60 days for international shipments. Claims must be filed within 120 days from the date of shipment. See above paragraph for iinsurance on shipments outside of the US. Shipping outside the USA is by First Class International. Tracking is not available for all international packages from the USA and shipping can take weeks. I may refuse shipping to any countries for which insurance is unavailable to me. The buyer is responsible for import fees such as duties, taxes, and customs clearance fees. I will only partially refund the If the order is returned due to the non-payment of these fees. I will deduct shipping and a restocking fee of 20%. I require a minimum purchase amount of $25 in product (not including shipping) to ship outside of the US. EU buyers can return an item within 14 days after receipt of the item. You (the buyer) are responsible for the shipping. Refunds are issued after I receive the item in its original condition. I strongly recommend you track your returned item. If you're not happy, I'm not happy. Please write to me directly if there is anything that is below expectations! I can fix anything that went wrong. If there is ever a problem, no matter how small, I will fix it if you write directly to me. If I have made an error (gasp!) or if I inadvertantly sent you a defective item, I will correct it. I will do so at no cost to you and I will ensure the situation is resolved quickly and with the least hassle possible. All you have to do is write to me via The Etsy convo system. Leaving a negative review without communication to me will not have the same effect. It's also okay to change your mind! You can always return items for any reason if you follow these return policies. Returns are accepted in the original quantity purchased only. I do not accept partial returns or "forced returns." Please contact me for a Return Authorization Number and return instructions within 5 days of the delivery date of your order. Once I receive your items I will gladly refund the purchase price of the item itself (not the shipping). I may also deduct any additional fees I incurred in shipping the item to you. Shipping is also deducted for returned purchases which were given free shipping. I do not accept returns without a Return Authorization. These are referred to as "forced returns." *Downloadable items are not returnable. Many of the pewter items in my shop are labeled in this way in the listings. It means there is less than 100 parts per million of lead and less than 75 parts per million of cadmium according to the data I am given by my supplier. I do not provide any certifications that I receive from my suppliers. If you need those certification you will need to buy from the manufacturer directly or get your own testing done. There are reliable testing kits that are relatively inexpensive. Nothing in my shop is intended for children under the age of 14 years. Can I get a refund if I changed my mind about something I ordered? Absolutely! Please contact me within 14 days of receipt of the item. I will provide a Return Authorization Number (RA#) and instructions on where to send your return. If it is returned to me with a within 21 days in original condition I will refund the price you paid for the original item less any additional fees I incurred in shipping the item to you. I do not refund shipping costs you paid to receive or to return the item. My order is not what I expected. What should I do? Let me know right away if there is anything that is below expectations! I will fix any imperfection or solve any issue, ANYTHING, to make sure you receive what you paid for. Just click on "Contact The Shop" from your on-line invoice and let me know what is wrong. If there is an error, item was not as described or beakage, I will fix it! You can track your order from your on-line invoice. If your order appears to be lost just contact me. It is rare but packages do sometimes get lost by the carrier. I take responsibility for ensuring your order is delivered to the address on your invoice. Insurance coverage for lost orders US orders applies to orders not delivered within 20 days of shipping. I want to add to an order I already placed, will you combine my orders and refund some of the shipping? Generally no. If you have forgotten something or want to add to your order please request cancelation and create a new order. This limits the confusion that results and ensures that I can purchase insurance for your order when needed. I ship the next business day and sometimes the same day! I offer wholesale discounts on larger lots of most items with a $50 minimum purchase. Just 2 examples are stainless steel chain on bulk rolls of 50 meters or more and many stainless findings and jump rings. Easy transaction and prompt shipment. Product as described.